You know, it is true what they say, that sometimes less is more. I mean, I’ve definitely told you how I love to make fancy pants birthday cakes for folks. And I think you might have seen some of the cupcakes I’ve fussed over in the past. Well, sometimes it is just not necessary to go through all that. 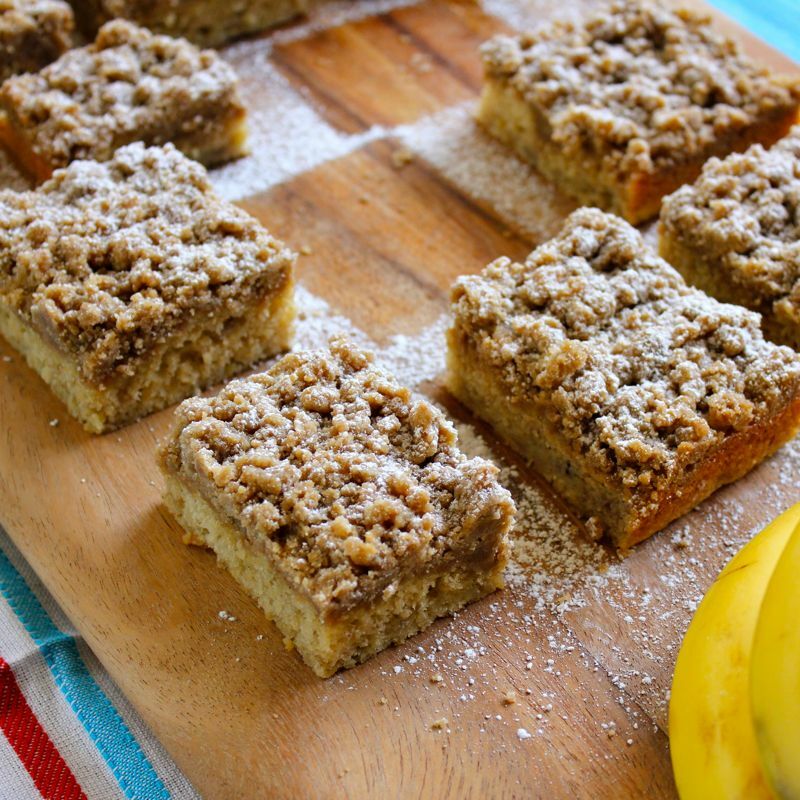 Sometimes folks just want a simple little bit of crumb cake to quietly enjoy with their morning cup of tea (or coffee as the case might be…) And I think I’ve found the perfect recipe for that in this Boozy Banana Crumb Cake. Now when I said “simple” bit of crumb cake, you didn’t think that I meant that it wouldn’t be flavourful and delicious did you? 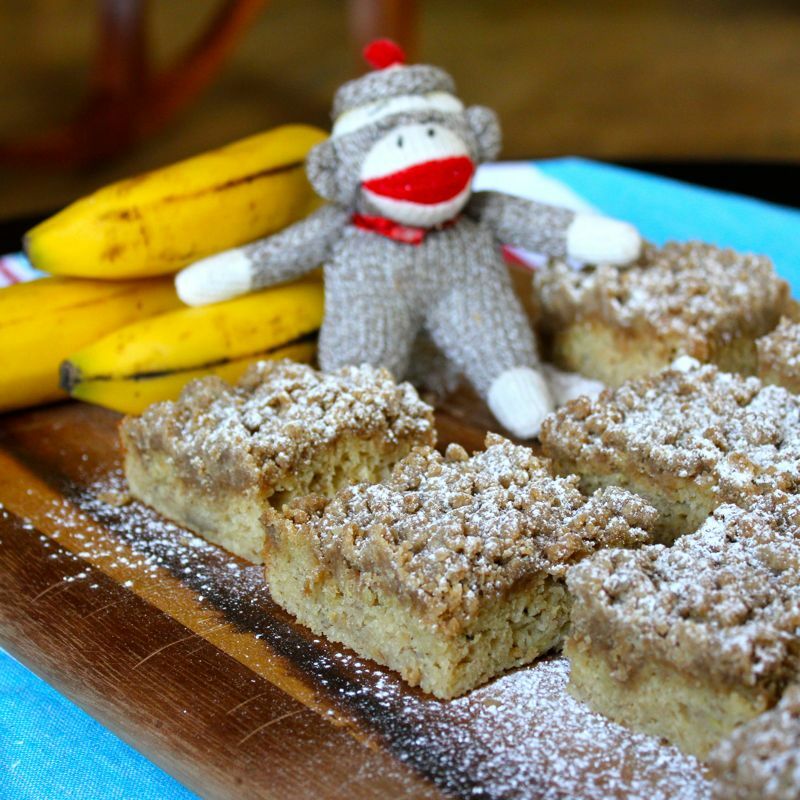 This crumb cake has all of the usual moist buttery goodness of your traditional crumb cake, but also has the fabulous addition of banana flavour added into the mix. And not just plain old mashed up bananas, which don’t get me wrong, those are great. But to really enhance the flavour of the bananas and just put them way over the top, they have been caramelized under the broiler with brown sugar and rum. Yup…RUM. Rum on the bananas and rum in the cake! Just the thing to give you that extra little something to get you going in the morning huh? 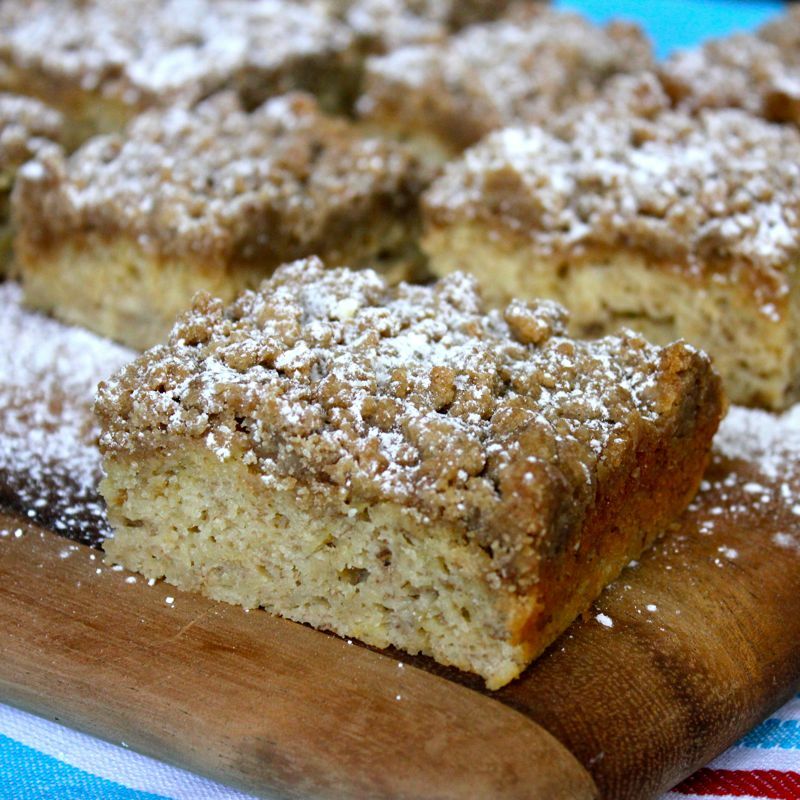 And being a crumb cake, this cake is topped with big buttery crumbles of cinnamon and brown sugar topped with a dusting of powdered sugar. So there you have it, no layers, no fluffy frosting, no fancy candy toppers. Quick and easy to make. Perfect for breakfast, mid morning snacks or with a scoop of ice cream added, a pleasing dessert. Simple home baking at its best! Line a small baking sheet or dish with aluminum foil (for the sake of easy cleanup). 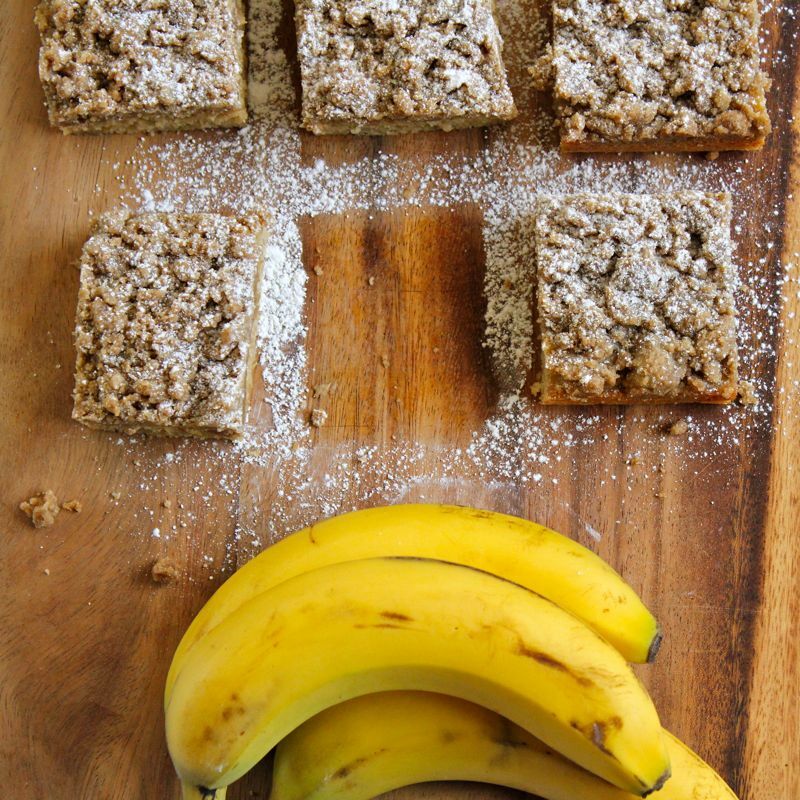 Peel your bananas and arrange them on the baking sheet. Prick them a couple of times all over with a fork. 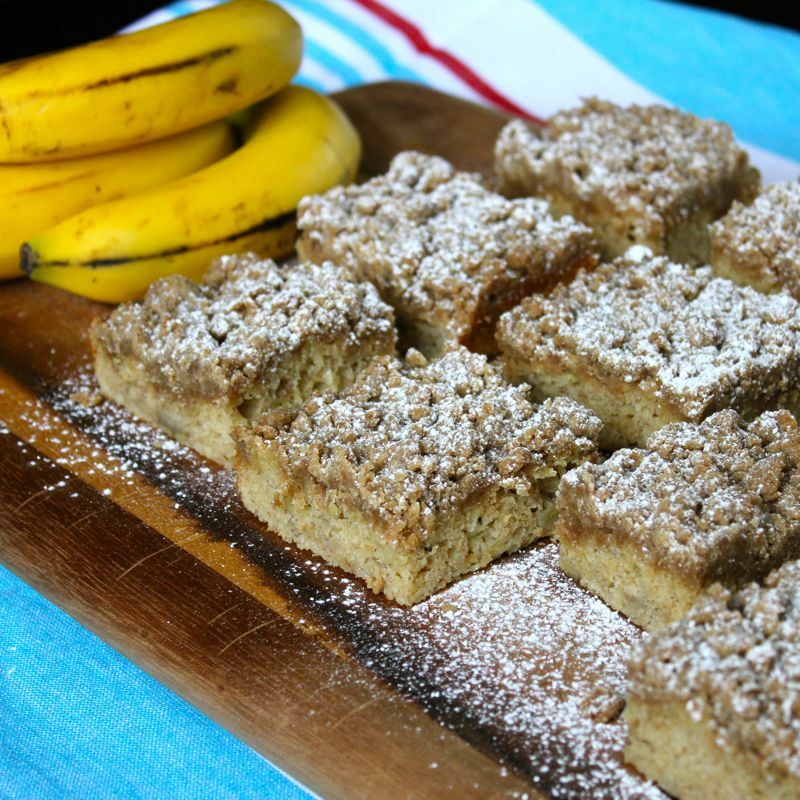 Brush the bananas with 2 tablespoons of rum (or more…), and sprinkle 2 tablespoons of brown sugar on top. Turn your broiler on high, and broil the bananas until the sugar begins to bubble and the bananas begin to burn slightly, about 7 minutes. Keep an eye on them! Remove the bananas from the oven and allow them to cool slightly. Dump the bananas into a bowl, making sure to scrape all that burnt sugary rum mixture into the bowl as well. Mash the bananas with a fork. Preheat the oven to 325ºF, and position a rack in the middle of the oven. Spray a 9×13″ pan with baking spray. In a bowl, whisk together the 1 1/2 cups of flour, sugar, baking powder, cinnamon and salt. Set aside. In a separate bowl, whisk together the mashed bananas, egg, milk, vanilla extract, and rum. Add the dry ingredients to the wet ingredients, mixing just until the batter comes together. Pour the batter into the prepared cake pan, and set aside. To prepare the crumb topping, in a bowl, combine the 2 1/2 cups of flour with the brown sugar, and cinnamon. Add the melted butter to the flour mixture, and stir the mixture together until large crumbs form. Sprinkle the crumbs evenly over the prepared cake batter. Bake the cake until a toothpick inserted into the cake comes out clean, about 25 minutes. Rotate the pan at least once during the baking time. Remove the cake from the oven, and allow it to cool completely on a wire rack before dusting the cake with powdered sugar, and cutting it into squares.